In my recent article for the FT magazine, The Scent of Tonka Bean, I describe how this revolution came about. Then I select three perfumes that use tonka bean in different ways and demonstrate how this ingredient can be somewhat of a chameleon. Tonka beans, the seeds of the Dipteryx Odorata tree native to South America, contain a component called coumarin. It’s present in many herbs and plants, including lavender, figs and cherry leaves, but tonka beans are so rich in this aromatic that it crystallises to the surface of their skin. Indeed, the very name coumarin comes from a French word for the tonka bean, coumarou. Coumarin was first isolated from tonka beans in the 1820s, and in 1882 it became the first synthetic material to be used in a perfume. To create a fantasy accord inspired by ferns, perfumer Paul Parquet added coumarin to the classical eau de cologne blend of citrus, lavender and geranium. Notes of amber, musk and oakmoss filled in the rest of the composition and Houbigant’s legendary Fougère Royale was born. Along with it, came a whole new family of fragrances called fougère, which in French means “fern”. To continue reading, please click here. 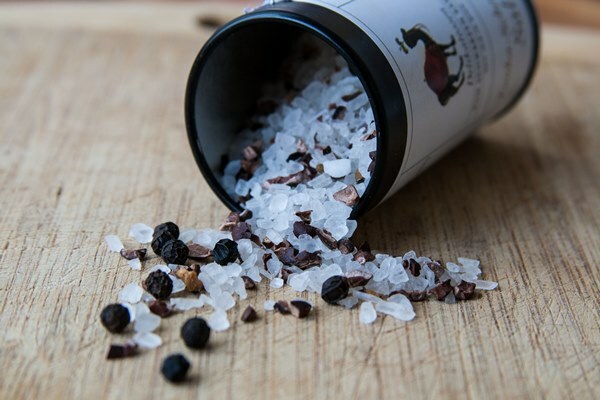 This salt recipe is inspired by the Tonka Schokolade Salz from Zum Schwarzen Kameel. I ended up changing the recipe by reducing the amount of tonka bean and shaving it instead of leaving the bean in large chunks. I find that it infuses the salt better, but feel free to alter the proportions to taste. Another great addition to this blend is roasted coriander seeds. Use about 2 Tablespoons for the amount of below. Put into a salt grinder and grind as needed. Do you use tonka in cooking? And do you have any tonka bean favorites among perfumes? Victoria: Tonka bean is best if used in tiny amounts, since it’s very strong and can overpower everything else. But if you dose it right, it gives a beautiful flavor reminiscent of almond praline and cooked cherries. It’s often used for sweets and baking, but I like it even more with something salty. Klaas: Oh, that salt looks superbe! Where does one buy tonka beans? I’d love to try them on some veggies!